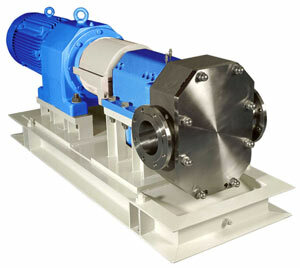 Fully swept pumping chambers and temperature capacities of 300ºF for CIP or SIP systems. Easy accessibility to seal area enhances cleaning and CIP capabilities. Generous seal access facilitates simple front loading and removal of seal, even for flushed and double options without stripping the pump. Cover joint profile improves hygienic characteristics and self-draining capabilities. Rugged gearbox construction enables the carrying of radial loads. Stainless gear cover and electro-less nickel plated bearing housing provide clean and corrosion resistant external finish. Mounting Options: The SteriLobe® range has cast stainless steel bolt-on feet which offer stable and robust support to the pump with the advantage of corrosion resistance. This enables the pumps to be mounted with shafts in the upper or lower position and for ports to be aligned horizontally or vertically. Rotor Options: 316 SS Bi-Wing or Multi-Lobe rotor options offer clearances to 300°F (150°C), making them suitable for all CIP and SIP conditions. Closer tolerance rotors are also available for low viscosity / higher efficiency applications, and Multi-Lobe rotors are also available in non-galling Alloy 808. Sealing Options: Hygienic mechanical seals. These hygienic seals are available: Single mechanical (standard), Single mechanical with low pressure quench, Double mechanical. Seal Faces and elastomers: Silicon Carbide / Carbon (Standard), Silicon Carbide / Silicon Carbide, FDA EPDM, FDA FKM, Perfluorelastomer. O-Ring Shaft Seals: Single O-ring seals in FDA EPDM, FDA FKM or Perfluorelastomer provide a simple, cost effective solution for lubricating liquids Running on hard-coated shaft sleeves, they are especially suitable for C.O.P. (strip clean) applications. Industrial Mechanical Seals: A DIN 94960 L1K seal chamber allows use of standard metric seals from many manufacturers, which is especially useful in applications where a site-standard seal supplier is specified. Porting Options: Port options include sanitary clamp, ACME, rectangular flange, ANSI-compatible flange and external NPT. Pump Heating and Cooling Options: All pumps may be fitted with rotor case and front cover heating jackets when required (except front cover jackets not available with integral relief valves). Relief Valve Options: All pumps except the SLHS pump may be fitted with spring operated piston type front cover relief valves to protect the pump and seals from over-pressure situations. Valves may also be specified with a handwheel for manual CIP opening or pneumatic operation for automatic CIP systems.